Today was quite a day! There were a lot of significant milestones along the trail today. 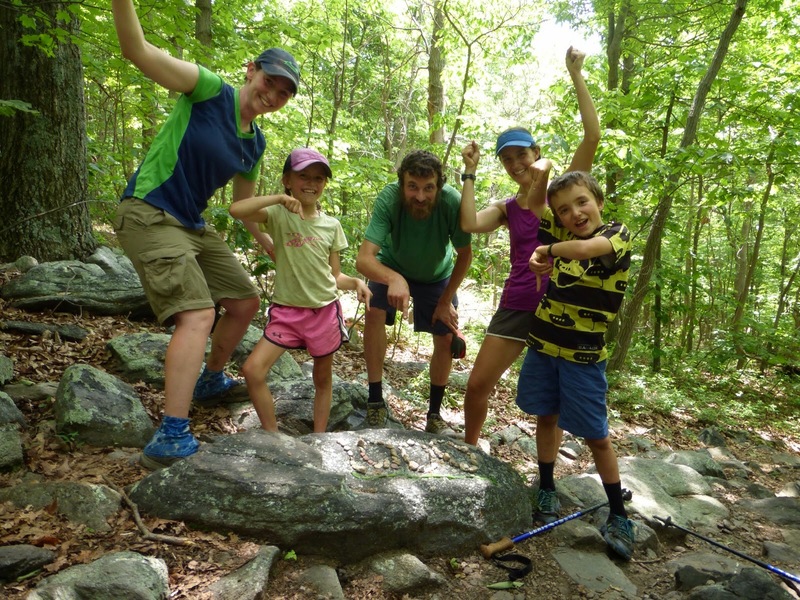 The Kallins were hiking the first 14mi with me and then getting off for the night to stay with a family hosting them. I am going into Harpers Ferry tomorrow and wanted to get as close to town as I could to shorten my hike into town in the morning. The mileage today really doesn’t matter since I’m also taking a zero the next day when my stepmom and some family friends are coming to visit. 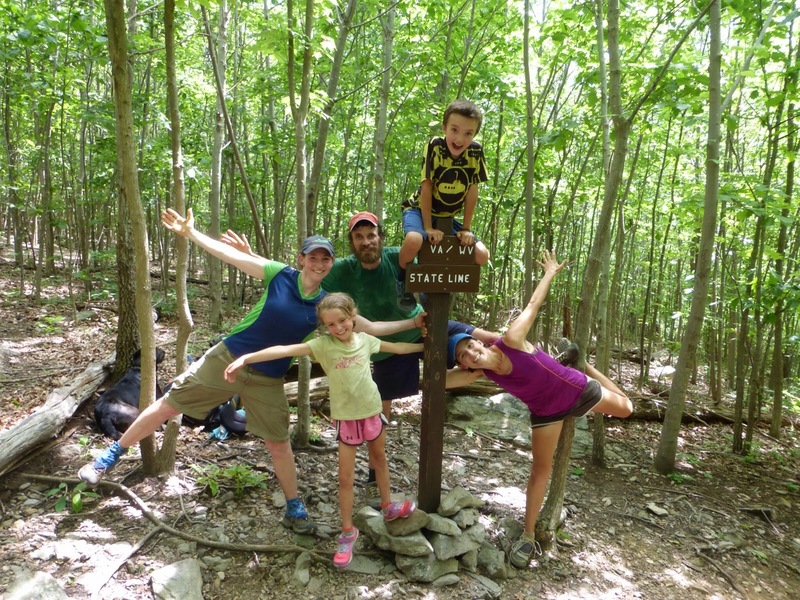 I really wanted to get to mile 1,000 and the border of VA/W VA with the Kallins, so I decided to do the pace that Cartwheel and Robin Hood could do until reaching those points around 10 and 14 miles into the day. 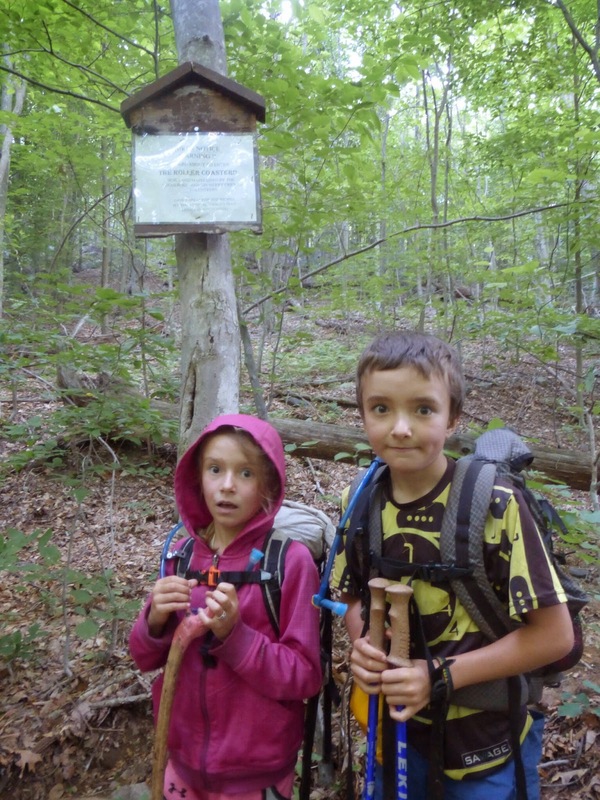 Our mistake was that we told the kids that I was staying until those mile markers so they were much more relaxed about the pace knowing I wasn’t going to hike on without them. The challenge was that this morning began the 13mi section of tightly packed ups and downs called The Rollercoaster. We all thought the elevation looked fine and that it wouldn’t slow us down much, but Robin Hood was greatly slowed by the heat/humidity and the hills. There were many breaks and it was slower going than usual, but we all had fun. The sign at the beginning of The Rollercoaster was entertaining and I had Cartwheel and Robin Hood give me their best scared looks by the sign. 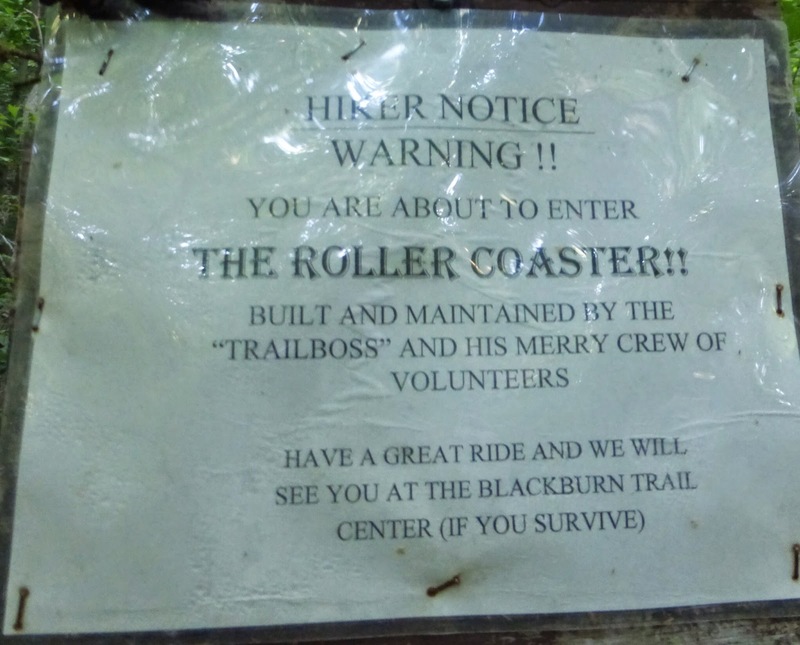 Their favorite part is where it says “if you survive.” Cracks me up! It was quite hot and humid in the 80s, but it was thankfully overcast. It was a good time and I am just amazed at what they can do. Today Cartwheel had no problem at all with the hills. She would stay right on my heels and talk to me the whole way up and then we’d take a break at the top waiting for Robin Hood and she was beaming with energy and enthusiasm. We all had fun doing more of our train conductor voices by yelling out the number hill we had conquered at the top of each one. For example, at the top of the fourth one, I’d announce “NUMBER FOUR!” Each person after that would yell it out in their own unique way, each stressing different parts of each word. On the way down, we just had to take pictures of it looking like a real downhill rollercoaster with our hands up in the air. I got a text in the morning from Ferris and the hiker he’s been with Easy Rider. They started out just one hour after us and about half a mile back from us this morning. That gave them motivation as we became the rabbits, as I like to call them, and we were motivated not to get caught. I was getting anxious about the slow pace, like I tend to do, but knowing I have flexibility tomorrow, I didn’t mind sticking with them most of the day and doing a lower mileage day. It’s a big step for me as I really resisted the strong urge to just HIKE. I just am too attached to the Kallins and had to do these milestones with them. 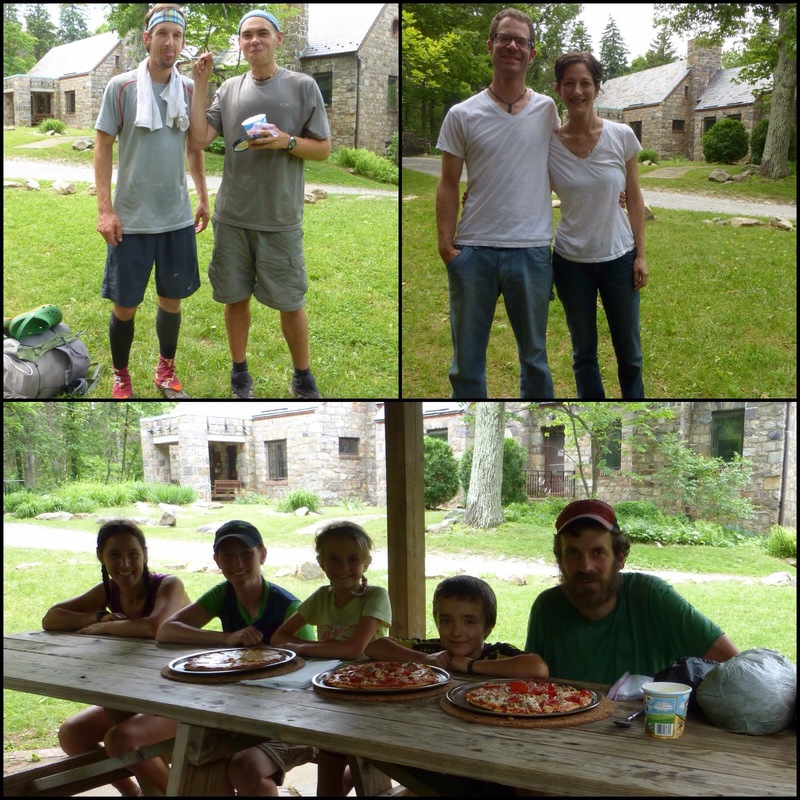 At mile 999, All In noticed that we were just .1mi from a side trail that led to Bears Den Hostel and that they sell pizza and ice cream…and it was lunch time. How could I say no to pizza and ice cream!? We went and found out that they usually don’t make the pizzas until after 5pm, but the owners, John and Dana, were super friendly and made an exception. We split two pints of Ben & Jerry’s while waiting for our three pizzas to arrive. It was a great treat! As we were finishing up, Ferris and Easy Rider arrived and got our leftovers and their own ice cream. 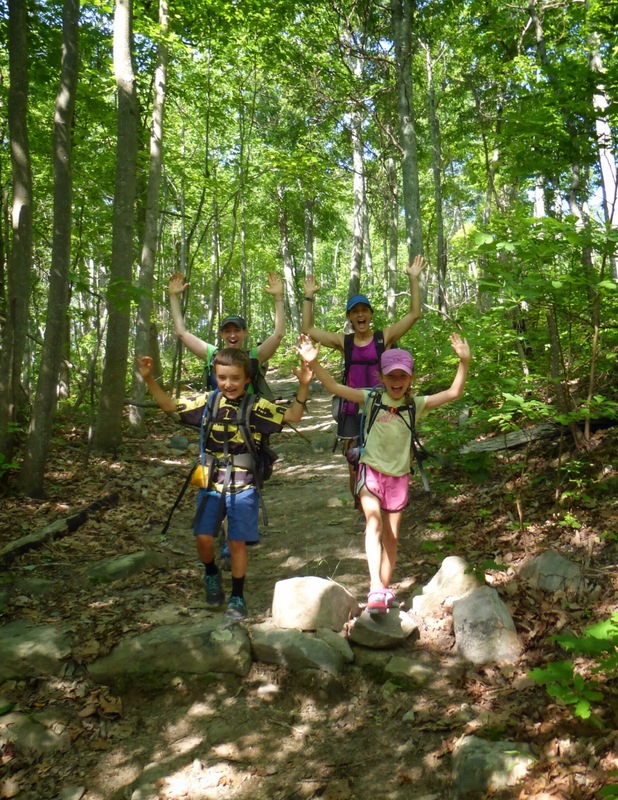 We hiked on while they finished their lunch and got to mile 1,000! It’s a big moment. Plus, I’ve hiked over 100mi with the Kallins since our first day together we took a photo at the 900mi point. 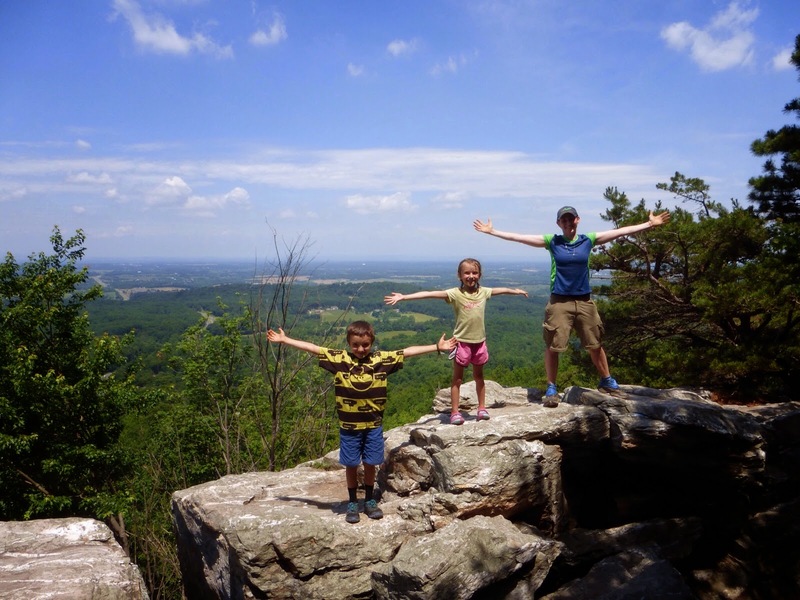 After that, I was so off on time that I was going to hike on my own the three to the VA/ W VA border, but Robin Hood and Cartwheel kicked it into gear and flew up the hill as Mama Bear took the lead with Orion. We made it up with Robin Hood and the moment of the day for me today was seeing the smile and pride on Cartwheel’s face as we cheered her to crossing the border into W VA. So great! While we were there. Three other thrus came through, including High Loon who I saw in town the other day at the restaurant. The Kallins have a really wonderful border crossing ritual of sitting in a circle and having each person say something kind about each other person in the family. They welcomed me into the circle this time and it was very bittersweet knowing we’d be separating. Such awesome people! Then Robin Hood and Cartwheel got special gifts to celebrate. 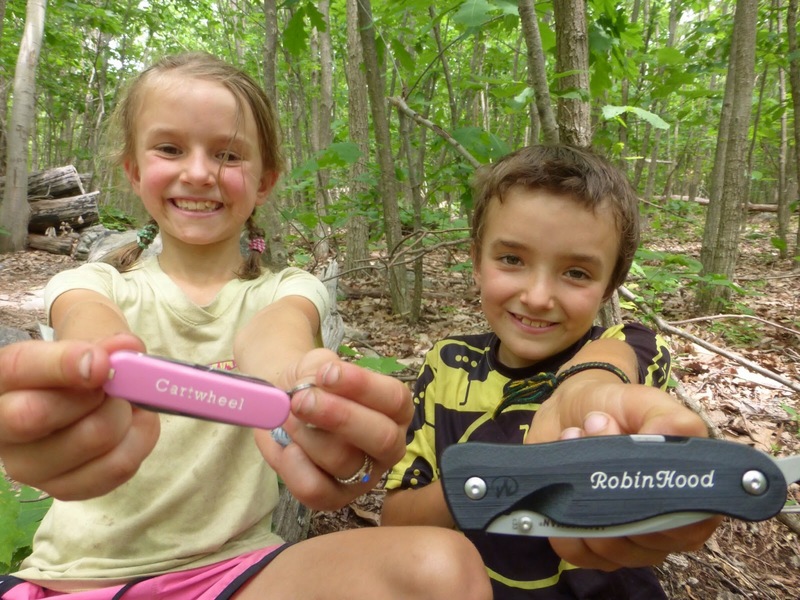 Their very own personalized pocket knives! We hiked another mile to their turn off for the day and said goodbye for now. It looks like we will still be overlapping the day after my zero, which is Cartwheel’s birthday, so it’s not goodbye for good just yet. It was oddly quiet walking alone the last couple of hours after almost a week of constant interaction. However, it was fun to listen to my music after such a long break and stretch my legs. The sky got darker and I checked the weather to see rain was definitely coming by 8pm. I decided to accept the lower mileage day rather than hiking on into rain. I stopped at the David Lesser Monument Shelter and it was nice! 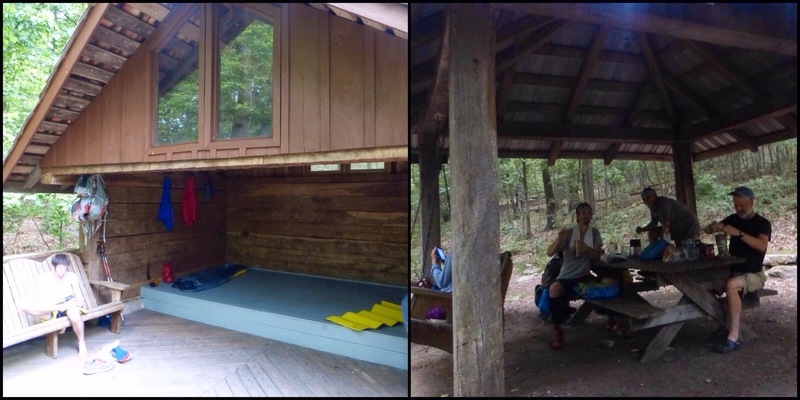 Super clean, wonderful benches and campsites, and a covered pavilion with a nice wide swing. Ferris and Easy Rider came by and decided to have dinner before hiking on in falling rain after 8pm to attempt 5 more miles as they also was to get to town early tomorrow. I got pictures of the shelter and pavilion, but I forgot to get a tent shot as it was raining after dinner. 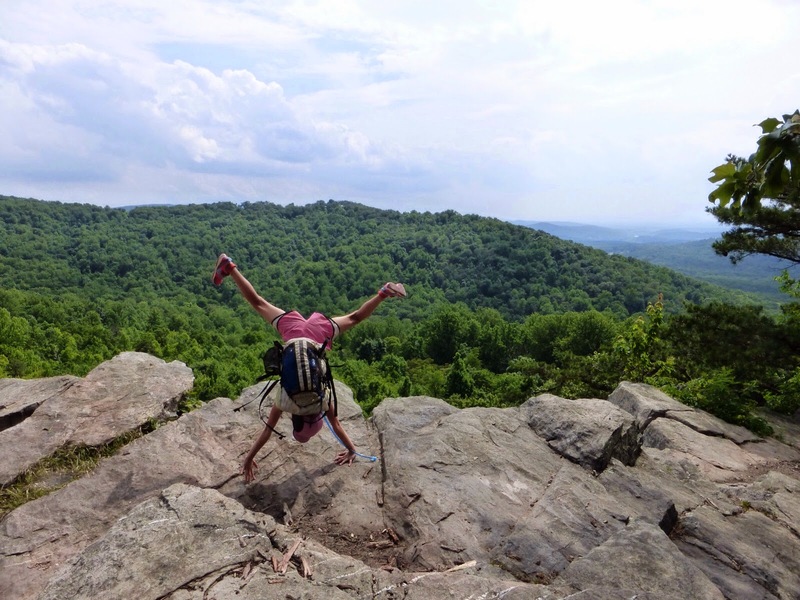 This is my least mileage attained on a full day of hiking, but it was totally worth it! I am happily dry and cozy as rain falls on my tent.